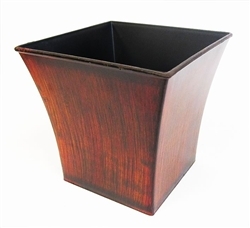 Ideal for 12"-18" and 18"-24" Manzanita centerpieces. These beautiful, rustic-looking containers hold everything from centerpieces to floral arrangements. Rustic Centerpiece Dish, Orange/Rust Rustic Brown Long Slim Design Container Short Rustic Centerpiece Container, Rust Glass Cylinder Vases Color Kit, 10 pieces - shipping included! Solid plastic container with god weight on it. A good finish that doesn't look cheap. Haven't used it yet but it is a good looking container.